alan hitt: What 2 Things Would You Say to Advise Your 25 Year Old (or much younger) Self? 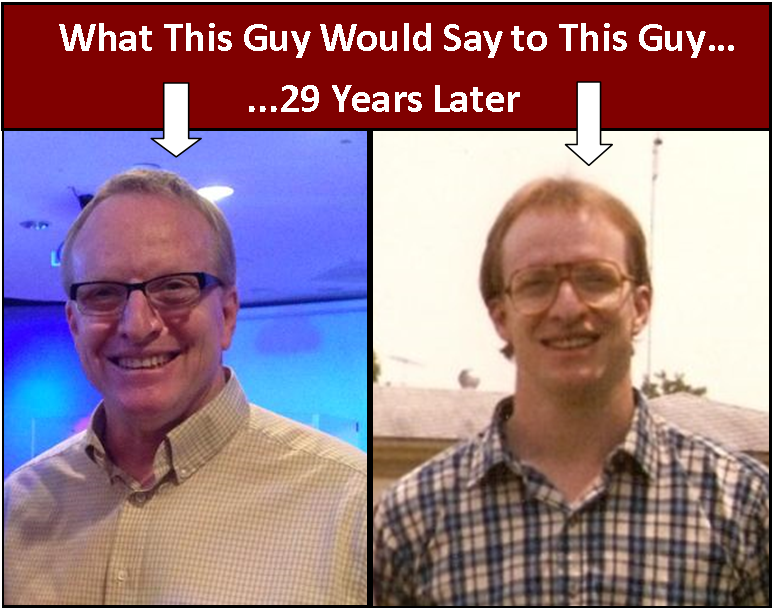 What 2 Things Would You Say to Advise Your 25 Year Old (or much younger) Self? 1. Take care of your dadgum business! Here’s what I mean by that. Be responsible. Honor your commitments and keep your word to your friends, family and employer. Do your work. Do it well, going the extra mile so that no one ever has reason to be critical of you. Some will be critical anyway, but at least you will know it is without reason. Pay your bills. Don’t get in financially over your head. Save 10%. Give 10%. Live on the rest. If you can live on less and give or save more, do it. Take care of your business! You will never be a leader in anything until you learn to lead yourself! 2. Do not wait for your dreams to come true! Figure out what your dream is and GO GET IT!! Build it! Uncover it! Hunt it down! Grow and nurture it! Whatever you have to do, but do NOT sit around waiting for the universe to deliver your dream to your door as if it owed it to you! The universe does not owe you jack-squat! So go get it. You may be passionate about a half dozen different things. Pursue each one until you find what your dream is if you have to. Once you find it, go get it! Get off your rear end waiting for it to accidentally stumble into your life. And by the way, if you think that to discover, build or bag your dream you have to abandon your commitments and shirk your responsibilities, then you just don’t have a clue about either commitments or dreams. 3. Print this out and re-read it every dadgum (can you tell I’m from Texas) day! So there it is. Take care of your business (or “TCB” as we used to say back in the day)! Go get your dream! And remind yourself of what’s important every day of your life! What would you say to your much younger self?